Cool girls places their patches in the right and perfect place. Below is an article that shows you where to place your patches just like a cool girl. It’s common practice for designers to look back to the past in order to design for the future. Take last year’s all-consuming ’70s movement as proof. But while some time-travel as far back as the renaissance, others have found their childhood to be more than sufficient in supplying ample inspiration (Marc Jacobs has often used his youth as a source), which is something that consumers are more than willing to embrace. Maybe it’s because it strikes a nostalgic chord that not only resonates within us, but gives us a reason to reminisce. Plus, these designs make for crazy great Instagram bait (case in point: Les Petits Joueurs’s lego-happy pursesspotted in the clutch of street style stars during Fashion Month). So it makes sense that patches, aka a childhood relic, has found success among the runways and on the streets. It calls to mind simpler days when the biggest stressor in life was figuring out which patch to iron on and where. Well, some things never change—at least for us. Recently, we agonized over which patch to iron on a pair of jeans. Of course, the easiest solution is to buy jeans with patches already embroidered on (no thinking required! ), but there’s something to be said about a custom, one-of-a-kind creation. We say, DIY it all the way! 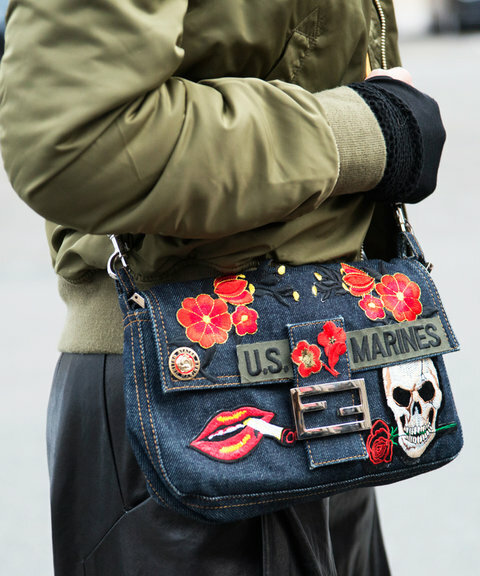 For help, we rounded up a ton of street style (and a few runway) examples for major patch-placement inspo. Go ham and iron them on everywhere, or fastidiously pick one or two for a less-is-more statement. And finally, keep scrolling to shop a few of our favorite patches to give your blues a cool-girl finish. 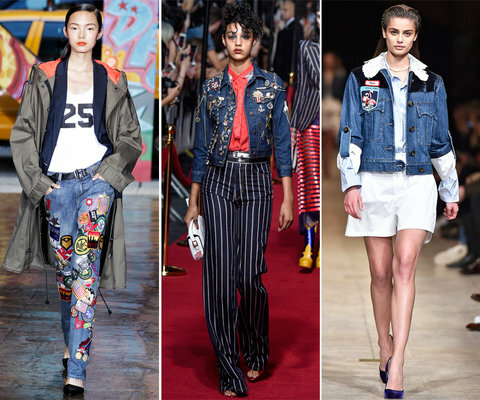 Donna Karan brought the childhood practice into streetwear, embroidering an eclectic mash-up of patches down the front of a pair of classic jeans on the DKNY spring 2014 runway (above, left). Marc Jacobs, who often uses his youth as a source of design inspiration, committed to an Americana theme for his spring 2016 show and sent out a pin- and patch-happy denim jacket (center). And most recently, Miuccia Prada reimagined denim in refreshing ways for Miu Miu’s fall 2016 collection, introducing everything from denim tailcoats to jackets personalized with nametag patches and cute flamingos (right). Spell out anything you want in varsity letters along each leg. Cluster them near the waist, but iron on a trail of patches down only one leg for a cool effect. Score bonus points if you match them to your slip-ons. Instead of a mash-up of every kind of patch under the sun, stick to one kind, like Stella McCartney’s lucha libre masks. Find your hero patch (a larger-than-life unicorn!) and make it the focal point by positioning smaller ones around it. Even minimalists can get in on this youth-inspired trend with just one. But make it count—hit a nostalgic note with a childhood symbol, like Captain America’s shield. Flirt with florals (as opposed to childhood, pop culture icons) for a more grown-up take. 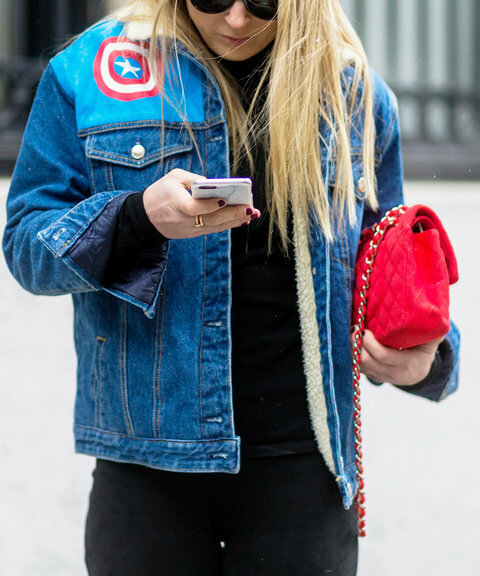 Embellish your denim jacket with a rosette or two, and then outline them with studs for an edge. Then: Patching your backpack with random bits and bobs. Now: Your designer purse with cool motifs. Make over your classic denim mini (we hear it’s making a comeback) and give it new life with themed patches, like Marc Jacobs’ stars and flags, along the seams. Don’t exercise restraint here. From Donald Duck to the Harley-Davidson logo, go ham and iron on everything you can find.